Carriage trade has been providing metal shopping carts to customers throughout the US since 1959. Our metal shopping carts are e-coated and then powder coated dark gray for a long lasting rust inhibitive finish. They feature 5" poly wheels with a fairly soft durometer for quiet operation and years of life. As usual, all of our shopping carts come with a child seat belt for safety. 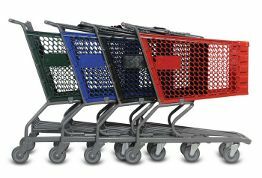 We currently have two types of single basket metal shopping carts as well as double basket two tier shopping carts. The single basket shopping carts are the stanard that you are used to seeing and the new E-series rounded modern look. Both are extremely rugged and are made to survive the long term abuse that carts withstand in their daily operation. You can view detailed information, including dimensions and capacity of the metal shopping carts by using the links below. Please note that the links below will take you to my online store and will allow you to see the detailed dimensions and Pricing.